The 2016 Health Disparities Research Institute scholars pictured alongside NIMHD leadership, committee members and HDRI faculty on the campus of NIH on August 15, 2016. The scenario Dr. Cooper described was only one of many to strike an emotional chord as the presentations got underway at the Health Disparities Research Institute (HDRI), hosted by the National Institute on Minority Health and Health Disparities (NIMHD). The HDRI, held on the NIH campus in Bethesda, Maryland, August 15–19, 2016, is a new research experience that replaces the previous 2-week NIMHD Course. 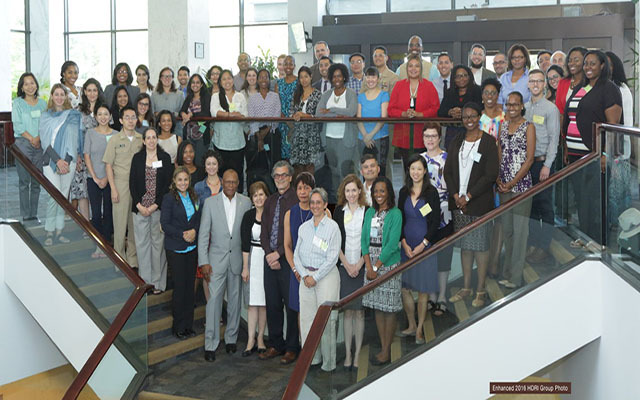 Designed to help participants understand the intersections between science, policy and practice and to learn about methods and cutting-edge issues in the science of minority health and health disparities, the 2016 HDRI had more than 500 applicants. Fifty-one scholars from 22 states and one U.S. territory were accepted, with credentials ranging from M.Ds. and Ph.Ds. to RNs and Pharm.Ds. to comprise the 2016 cohort. The HDRI included this practical coursework to foster immediate engagement with NIH’s extramural programs once scholars return to their home institutions. In addition to hosting interactive sessions, leaders in minority health and health disparities research covered related topics, such as biologic and behavioral mechanisms, systems science and complex models, healthcare interventions, and quality measurement and methodology for eliminating disparities in health outcomes. NIH staff also gave presentations on scientific workforce diversity, grant matchmaking, and research on sexual and gender minorities, now designated a health disparity population. Throughout the week, scholars shared their enthusiasm for the HDRI and what it would mean to their work going forward. Scholar Dr. Daniel Giovenco, a research associate in the Center for Tobacco Studies at the Rutgers School of Public Health, said the HDRI not only addresses the issues surrounding health disparities but also creates pathways to find the solutions. “What we’re learning here is that it is not enough to simply identify that health disparities exist, but that all of our research should have the ultimate goal of making changes influencing and improving those health disparities,” said Giovenco. Cooper LA, Boulware LE, Miller ER 3rd, Golden SH, Carson KA, Noronha G, Huizinga MM, Roter DL, Yeh HC, Bone LR, Levine DM, Hill-Briggs F, Charleston J, Kim M, Wang NY, Aboumatar H, Halbert JP, Ephraim PL, Brancati FL. Creating a Transdisciplinary Research Center to Reduce Cardiovascular Health Disparities in Baltimore, Maryland: Lessons Learned. Am J Public Health 2013;103(11):e26-38.